It’s something of an understatement to say that I’m a big Michael Jackson fan. I don’t just have all of his albums, I have most of the singles – and many of them on 12” vinyl promo. I have an original full set of early 80s Michael Jackson dolls, some of which are boxed. I have a collection of MJ jackets, including a leather Thriller Jacket and the rare Victory Tour jacket. I saw him live in Cardiff on the Dangerous Tour in 1992. I saw the opening night of the History Tour in Prague in 1997, and two of the Wembley dates the following summer. I also had tickets for the opening night of the This Is It concert last year. Not just tickets either, Thriller VIP hospitality tickets – costing over a grand for the pair. I opted for the printed holographic ticket instead of a refund, I have the Michael Jackson Opus book and yes, I used to subscribe to ‘King’ magazine. It’s safe to say I’m something of a fan. 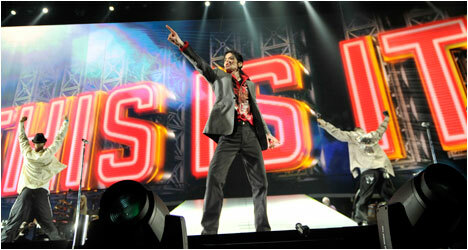 Therefore the chance to review Michael Jackson’s This Is It on DVD is something not to be missed. When I heard the news last summer that Michael was rushed to hospital I sat, like many people across the world, transfixed by the news channels while checking websites for updates. Twitter fell down with the clamour for news and Facebook was alive with rumours and hearsay – sadly most of it turned out to be true. The tragedy every fan had feared had finally happened, at the worst time possible. Many believed that Michael wasn’t in good physical or mental shape and that the concerts wouldn’t have gone ahead regardless. The video footage that was compiled to form last year’s theatrical release of This Is It proved otherwise. Michael was in fine shape and the concerts were ready to go. This would have been the pinnacle of his career in terms of liver performances, and thankfully it was recorded so that we do get the chance to enjoy it in some form, even if it is incomplete. This Is It has an eerie quality all of its own. The empty stadium, the casual nature of the presentation, the fact that the production was never performed; it all makes for awkward viewing. Putting that aside however and you have a truly spectacular concert showing that Michael was still at the top of his game, both vocally and artistically. Highlights of the show include the specially shot video footage for the introduction of Thriller and the tear inducing final performance of Billie Jean, which earns Michael one last ovation from the watching dance troop, many of whom would have grown up watching him dance. The film starts off in a tearful manner, but doesn’t dwell on what happened. The film is about Michael as a performer and about the concert that he worked so hard to put on. It’s a celebration of life and talent, rather than a lament at the loss of it. Watching this in the cinema I was caught between two contrasting emotions. I was delighted that I got the chance to watch it, to enjoy it and was singing along at certain points as though I was at the concert in person. I was also devastated that the concert itself would never be seen live, as it was intended. In the weeks following Michael’s death I tried to avoid the television as much as possible as I knew every TV channel would try to capitalise on the event by hashing together old footage from various videos and putting out ‘tribute’ programmes. I’d seen all of this footage before and didn’t want to see the same sequences over and over, in what was basically just an attempt to gain ratings from fair-weather fans. The special features on The Is It however contain more than 2 hours of unseen footage, and as someone who has edited together behind the scenes footage from Michael’s Stranger in Moscow video for a screening at the 40th Birthday Bash in London in 1998, I know my ‘unseen’ footage from my ‘often seen’ footage. The highlight of the special features has to be the unfinished rehearsals, where you see footage from rehearsals that wasn’t included in the film. The stand-out section here is the rehearsal footage for Dirty Diana, where a huge bed had been created for Michael to perform on with a pole dancer. The bed included poles at each corner, and a roof structure, where we see the talented pole dancer swinging around and performing while the bed itself is encapsulated in fire. This would have been one of Michael’s raunchiest stage routines. Another interesting aspect of the special features concerns the search for his dancers, where a talent show similar to ‘So You Think You Can Dance’ is held, featuring dancers from all over the world flying in to win one of the 11 places on the crew. This would have made a great series in its own right, and features some very talented dancers. There hasn’t been a DVD (or video) release of Michael’s that has given this much insight into his creative process as he was such a private man. This release gives you that tinge of sadness that the concerts never happened, but the feelings of joy experienced when watching it far outweigh any negatives. This, as Michael said himself, is it. I have the Blu Ray disk of This Is It and have watched it twice already. I didn’t see the part you just described “The stand-out section here is the rehearsal footage for Dirty Diana, where a huge bed had been created for Michael to perform on with a pole dancer. The bed included poles at each corner, and a roof structure, where we see the talented pole dancer swinging around and performing while the bed itself is encapsulated in fire.” Where on the special features part is this section of film. I’m going to go watch it again to see how I could have possibly missed that part. Please tell me what is shown just before that part of the film so I can look for it. Thanks. Well written, articulate and spot on article! Something of a rarity where MJ was concerned.The’ This is it ‘ documentary shows the real Mj more than all his other videos. The very imperfections shown there accentuate his human frailty and show the hard work required for the perfection he aspired for in all of his work. Thank you your insightful article,Mr Darren Jamieson. Hi – I have the DVD, but I don’t find the Dirty Diana rehearsals. Is it on a different edition? (or am I just not finding it?) Thanks. The Dirty Diana sequence is in the ‘unfinished rehearsals’ on disc 1 of the 2 disc set. It starts off with footage of the dancers from Smooth Criminal, in the chandeliers. Michael isn’t on the bed himself because the rehearsals never got that far, but the bed is on the stage, with the pole dancer and one of Michael’s choreographers standing in for him while the routine is worked out.